international neo-expressionist movement, which rejected the prevailing trend against imagery (the so-called “death of painting”) in favor of portraying recognizable subjects in an expressive, gestural aesthetic. Africa. Inspired by the dramatic African light, bright sun, scorched earth, and rocky landscape, Barceló made a series of pale, intensely textured canvases that recall the arid, rugged terrain of the desert. paintings are like traces of what has happened there, all that happens in the head, in fact. 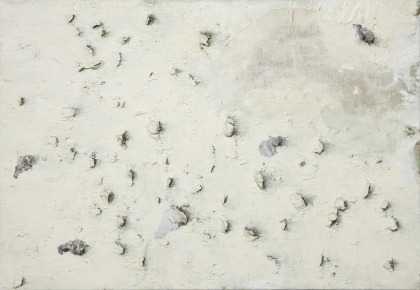 The picture object is a bit like the sand of the arena, a sort of detritus of what took place there.” In adopting this culturally resonant theme, long symbolic of Spanish national identity, Barceló continues in the tradition of great Spanish painters from Francisco de Goya to Pablo Picasso and Salvador Dali. Before bullfighting was banned in Catalonia in 2012, after nearly 700 years of fights, Barceló designed the official poster for Barcelona’s last bullfight. the Palma cathedral demonstrates his mastery of ceramic, which has played a large role in the artist's oeuvre since the mid-1990s. world. Atop this radiant, multi-colored surface, Barceló applied a directional spray of blue-gray paint, which causes the ceiling’s appearance to shift depending on the viewer’s perspective in the room. From some angles, the blue-gray hue predominates, and then from others, the installation radiates with vivid rainbow hues; this emphasis on perspective speaks to the importance of looking at the work from different viewpoints, just as issues discussed in the United Nations need to be examined from multiple angles. illustrating Dante's Divine Comedy were shown at the Louvre Museum in Paris in 2004, he became the youngest artist ever shown in this museum.